Shabda is the basic unit of sound from which the world is shaped according to the main Indian darsanas, and the creation root of each mantra. Deep listening and repetition are the keys around which the identity of the project is built, and the channel to direct the search for timeless and spaceless dimension of being. Ideally channeling Marco Castagnetto and Anna Airoldi spiritual research, supported by guitars from cultural saboteur Riccardo Fassone, Shabda explores the fil rouge that holds the Tradition in Tantric Shaivam Indian currents, Taoist and Occidental alchemy, Tibetan Lamaism, Sufism and the Fourth Way as theorized by Gurdjieff. According to Terry Riley, tradition is only "what works", and it exists as a result of constant experimentation devoid of dogmas and easy morality. Combining obsessive doom riffs and traditional indian melodies on ambient frames, Shabda produces slow, repetitive, trance-inducing music that will delight fans of Earth, Popol Vuh and La Monte Young. Shabda play Drone on their own ritualistic terms. A three piece comprising of the use of a laptop, guitar and a sitar, they have a shamanistic quality about them that conveys deep meditative states and the embrace of both inner peace and turmoil. I mean, you can't have one without the other, right? The two are interlocked within us since the dawn of time, biting each other on the neck and vying for dominance. 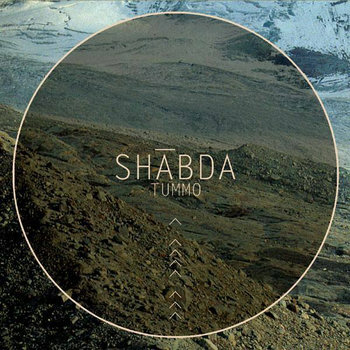 It is this incorporation of Tantric dynamics and various Indian mystical philosophies that Shabda fuse and funnel together to make their new album 'Tummo' very special indeed. This is an excursion of the spirit, but it does have it's darker moments so don't be put off by the decidedly introverted nature of the recording. With only three tracks total, and each averaging around the 15 minute mark in length you are going to require a degree of patience and to be in the right place to absorb it properly. 'Kamakhya' has generous build woven through it's introduction, with some lighter than air tones and spacious scope. It's never in a rush, and I really appreciate that quality in this breed of music. The sitar is by no means a gimmick, either: it's use is liberal and utterly relevant. And it's so very evocative too. As you listen you can practically smell incense in the air, and I found myself wishing I was in a tent in the middle of the desert while my spirit animal urinated on the shackles of my mobile phone (he says, typing this up on his computer). Whatever was happening, I liked it. And that's the power of transportation that this music can affect within a listener. But to entice the bangers out there, like I said there is darkness at the end of the tunnel and it does descend into inner doom and despair. The last third of the track is riff city, and that inner peace is attempting to get thrown up all over the floor. What did you eat last night, dude? Quite clearly some inner peace. Damn fine listening though. The rest of it is just as at odds with itself. '619-626 Hz' starts with ethereal chanting and communing with otherworldly things, gradually cranking up the drone and the ambiance. This is a melting pot of the mood, and it channels some real turbulence and unease again at various points. The Indian influence is particularly strong here, and the cultural sounds are an exciting clash of styles - think modern Sunn O))) meets Ravi Shankar. Sounds interesting? It really is. This album is out there, maaaaan. 'Tummo' is right on the fringes of modern drone, experimenting with all kinds of altered states. It is an extremely rewarding thing to listen to, but do approach it with an open mind. Not for everybody, but those who do let it in shall surely reap it's benefits. Personally I would highly recommend that you do so. Thanks to ArgonautaRecords for sending ourselves a promo to review. TUMMO is available to buy now on CD.